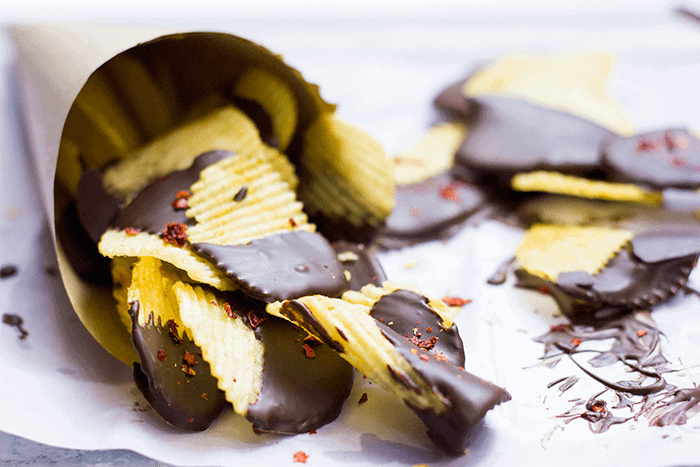 Chocolate covered potato chips are sooo much better than they sound! You have to try just one to experience how addictive these can be. 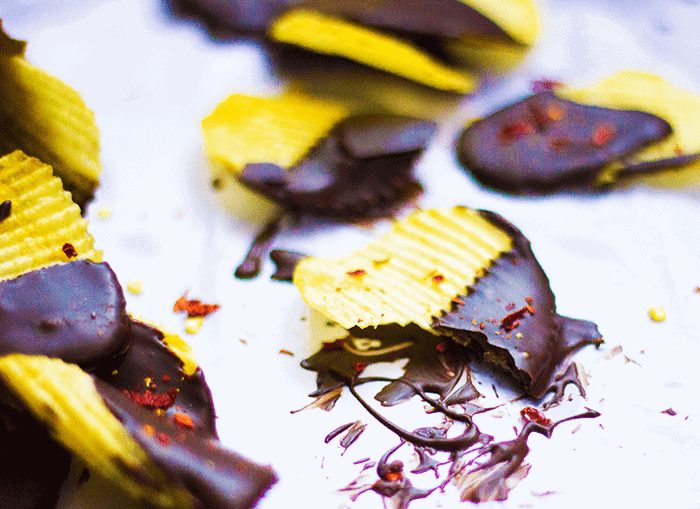 A sprinkle of chilli flakes gives these an incredible sweet, spicy, salty twist that is hard not to love. Chomp away! Are you a person who likes to combine their snacks and desserts? Someone who enjoys the elements of Sweet and Savoury on one plate? Then this is for you and this is officially the best potato chip snack ever! I personally like to go crazy with my ingredients and like to experiment with different flavours and elements. This snack pleased the foodie in me and you cannot argue with me till you try it out yourself. Deal? I promise you this – you won’t be able to stop with one. Have you been watching the World Cup lately? I’m guilty of missing a couple of matches but I religiously tune into the ones that India plays. Because Team India – the best! Don’t we glue ourselves to the screens and stay arrested at one place when our team plays? We are always munching on something (read: same old potato chips). 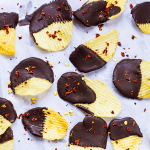 I saw these Chocolate covered Potato Chips on Pioneer Woman’s blog some time ago. They looked kinda crazy and what better source of inspiration than some craziness? So I had to try them out and I was blown away! I added a bit of Chili and they became even better because Chili just seams to bring out the flavours of other elements. I mean, everything’s better with chili right? This is officially not a recipe because they are so damn easy to make and they’re a perfect snack when you do not have too much of time at hand but you still want yourself or your guests to munch on something they can relish. So I’m just going to write it down anyway. Chop the chocolate up in a microwave safe bowl. Microwave on full power for 1 minute. Pause at 30 secs and whisk lightly using a fork and repeat after 30 secs. The chocolate should have melted after 1 minute. If not, microwave for another 15-20 secs, making sure not to burn, just melt. Use thick potato chips like Lays because the thin ones tend to get soggy. Dip each chip about half way through in the melted chocolate. Place them on a tray lined with parchment or butter paper. 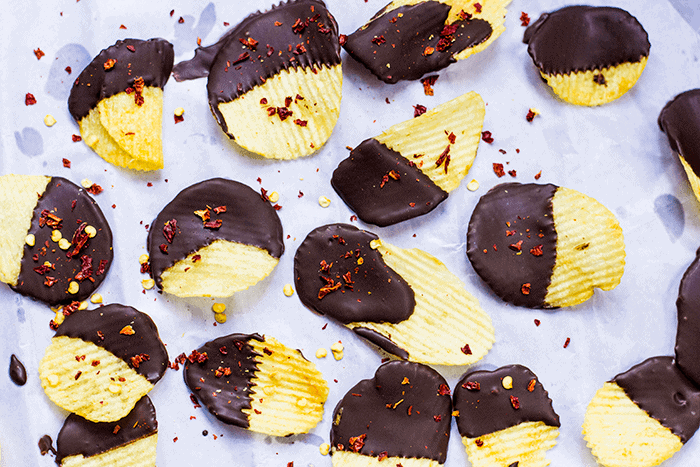 Sprinkle the chocolate covered part with chili flakes. Place them in the refrigerator for 15 minutes till they are completely dry and the chocolate has hardened. Devour. These are super addictive AJ and so easy to make that you’ll end up making them over and over again. Hope you try them! I’m a sucker for Indian food, and then I come here and get instantly attracted to this! Chili! Chocolate! Potato chips! I need these. Thanks Gayathri! This has never lasted us more than a day but yes, you can store it in air tight containers or sealed packets for a few days. Just make sure it’s not in a warm are because the chocolate might melt. Can this be made in advance say a week and stored in food packets? Thanks. Love ur blog.. This looks spicy and addictive!